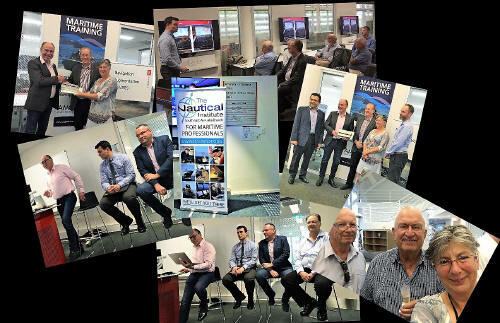 We had a great Focus Event on 5th Feb at the Australian Maritime College’s training space at the Australian Maritime Museum in Sydney. The IALA ENAV working group were there along with a distinguished panel to explain about the latest fascinating developments in Maritime Digital Communications (photos above). It was wonderful to hear how things are progressing at a very fast pace in this area. Then on 13th Feb Captain John Cardelli gave an interesting talk at the combined meeting of the NI/CoMMA/AIN in Sydney. Please look in the Members Area for a details and photos of the presentation. Please note that WISTA (Women’s International Shipping and Trading Association) have invited us to breakfast in Melbourne on Tuesday 5th March to celebrate International Women’s Day – full details are here https://mailchi.mp/a1bfefd71c5c/international-womens-day-breakfast?e=e6ae2c140f Please contact me if you need more information. Also please note that there will be a Nautical Colleges’ Reunion in Sydney on 24th of March. If you may be interested in that please contact me. Captain Peter Martin of our Tasmanian Section has recently written some fascinating articles concerning Matthew Flinders, an article on one of our Women in Maritime – Holly Saunders, and a letter to Seaways. All can now be found in our Members Area (If you need the login and password just contact me).